Stop. And. Listen. Do you hear bees buzzing in your yard, hard at work? If we aren’t careful, that could soon be a sound of the past. Whatever you do this spring, don’t pull out the dandelions that pop up in your yard or garden. Yes, I know that we have all been convinced by yard maintenance companies and marketing that dandelions are not aesthetically pleasing and therefore they should be sprayed or pulled out. But, dandelions are the first source of food in the spring to feed our precious, hard-working bees (and other insects). Bees are responsible for the pollination of approximately 35% of our food supply and it is our job to protect them. With the widespread use of pesticides and chemicals on crops we are killing off the bee population at an alarming rate. While the world stopped to listen to the story of Kim Kardashian’s Paris robbery last year, we missed noting that bees have been put on the endangered list. Without bees, we can expect to see a significant impact on the agricultural industry. 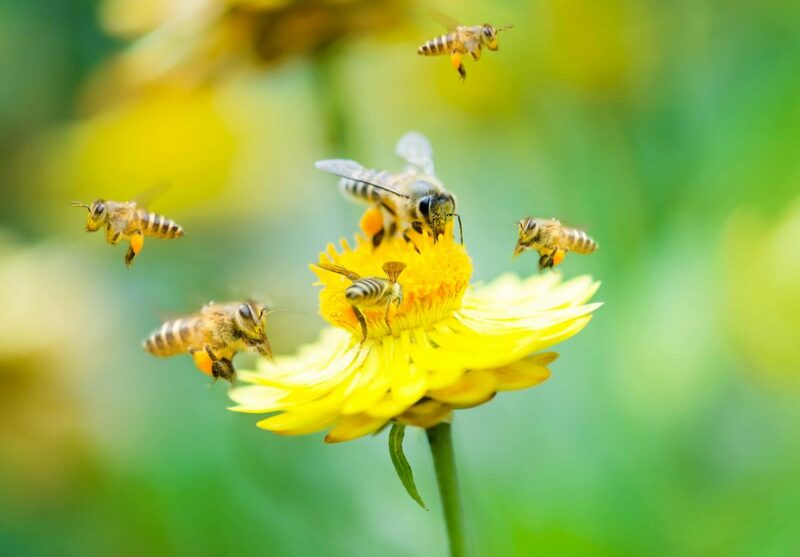 Although bees are not necessary for the pollination of all crops, they do play an integral role in the pollination of melons, squash, nuts such as cashews, brazil nuts and almonds, apples, berries (raspberries, blueberries, blackberries, and strawberries), and stone fruits. As the bee population continues to be affected, the concern is that these fruits and vegetables will be available in lower yields, which would drive the cost of these up as availability is reduced. Understanding that these are the staple foods of a whole food diet, it is concerning that a diet consisting of whole foods is likely to become less accessible and therefore could have a negative impact on the health of our communities moving forward. Spread the word about the bee population. Talk to your neighbours, friends, family and whoever else you come into contact with. Start a conversation in your community about what can be done to reduce the use of chemicals and pesticides. Starting a community gardening program is an excellent way to educate the community on the importance of the bee population while growing organic produce. If that isn’t an option in your community, starting a small backyard garden is easy and extremely rewarding. Bees love flowers, fruits and vegetables, so pick your favourites and start growing! Finally, by purchasing local, raw honey you are supporting a local farmer who is working hard to maintain the bee population. The nutritional benefits of eating raw, locally sourced honey include providing anti-viral, anti-fungal, and anti-bacterial properties. Raw honey is also rich in vitamins, minerals and enzymes. Most honey that we buy in the grocery store has been processed at high temperatures and has additives, which radically reduces the effectiveness of the honey in your diet. We encourage you to do whatever you can to help save the bee population. It could be as simple as planting a patch of wild flowers, eliminating the use of chemicals on your lawn or letting your dandelions thrive this spring! Previous articleHave you heard of this miracle oil? You should be using it! Next articleHave you ever been angry at your kids for ’swooshing’?